Evapotranspiration (ET), which is one of the major components of the water balance over the Nile basin, accounts for about 87% of the basins rainfall but varies from one sub-basin to another based on land use/cover and the prevailing climatic conditions. It is difficult to measure ET but recent advances in satellite observations have enabled its estimation over large areas such as the Nile basin. 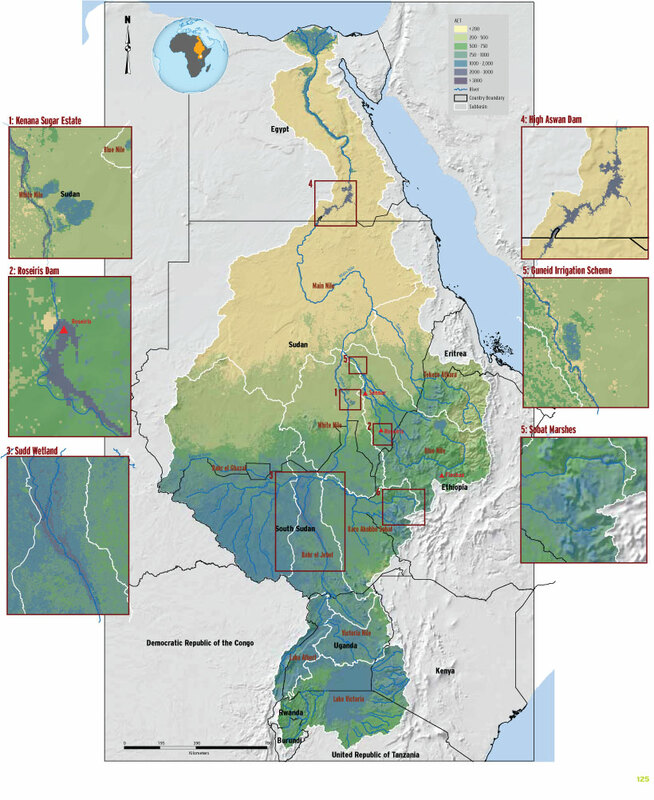 As seen from the maps provided, the Nile basin exhibits very wide ranges of evapotranspiration due to the variations in altitude and climate within the basin. Wetlands and irrigation schemes are seen to have a lot of evapotranspiration within the sub-basins where they belong. The Nile Basin also exhibits a wide range of evaporation depending on the location and size of the water body within the basin. The major open water bodies (Lakes and dams); Lake Victoria, Lake Nasser, Lake Tana, Lake Albert and Lake Kyoga are the major culprits to water loss in the basin due to evaporation. In this atlas, we present the mean annual actual evapotranspiration, the mean monthly actual evapotranspiration, and the actual evapotranspiration for lakes Victoria and Tana. From the maps, it can be observed that the equatorial lakes region and the Ethiopian highlands as well as the open water bodies have very high values of actual evapotranspiration compared to the downstream parts of the basin. These actual evapotranspiration maps are based on MOD16ET product for the period 2000 – 2012 prepared by the NBI.